The Lead II rhythm strip shown in Figure 1 was obtained from a 50-year-old woman with new-onset chest pain. Can you explain the 3 pauses seen (between beats #5-6; 8-9; and 11-12)? 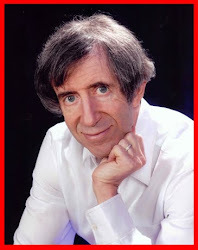 What might a 12-lead ECG show? Figure 1: Lead II rhythm strip obtained from a woman with chest pain. (Reproduced from ECG-2014-ePub). What is the rhythm? NOTE – Enlarge by clicking on Figures – Right-Click to open in a separate window. Each “group” of beats (ie, beats #1-thru-5; 6,7,8; 9,10,11; and 12,13,14) – is separated by a short “pause”. Each of the short pauses (ie, the distance between beats #5-6; 8-9; and 11-12) – is approximately the same duration. Each of the pauses terminates with a QRS preceded by a fixed (albeit slightly prolonged) PR interval. The pause that contains the dropped beat is less than twice the shortest R‑R interval. Beyond-the-Core: The R‑R interval following each pause is longer than other R‑R intervals in each group (ie, the R‑R interval between beats #6-7, 9-10, and 12-13 – is longer than the R-R interval between beats #7-8; 10-11, and 13-14). There appears to be ST segment elevation in this lead II rhythm strip. The patient has new-onset chest pain. The conducting beats (ie, beats #6,9, and 12) manifest 1st degree AV block. Armed with the knowledge that AV Wenckebach is likely – we pursue definitive diagnosis by determining IF a regular atrial rhythm is present. Use of calipers greatly facilitates the process. Starting with one of the conducting P waves (say, beat #6) – One can set calipers to the P‑P interval between beat #6 and the obviously-hiding P wave that provides an extra peak in the ST segment of beat #5. Doing so allows us to walk out regularly-occurring P waves throughout the tracing (short vertical lines in the Atrial Tier of Figure 2). The remaining 2 tiers in Figure 2 (AV node and Ventricles) – clearly demonstrate documentation of AV Wenckebach with progressive lengthening of the PR interval until a beat is dropped within each group. The sequence of progressive PR lengthening then begins again as new “groups” begin with beats #6, 9, and 12. For a Review on the Basics of Laddergrams – Click HERE. Figure 2: Laddergram of the Lead II rhythm strip shown in Figure 1. 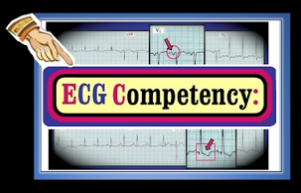 (Reproduced from ECG-2014-ePub). Progressive lengthening of the PR interval within each group until a beat is dropped. Pause containing the dropped beat is less than twice the shortest R-R interval (unlike what may occur when there are sinus pauses or blocked PACs). Progressive decrease in the R-R interval within groups (because the greatest increment in PR interval is usually between the first and second beats in any one group). Conducted beats manifest 1st degree AV block (since with inferior infarction both 1st degree block and Mobitz I are often the result of AV nodal ischemia). Not all of the above “footprints” will always be present – and they are not all needed to make the diagnosis of Mobitz I. But awareness of the relationships illustrated in Figure 2 should make recognition easier in cases like this one when the atrial rate is relatively rapid and P waves are partially hidden within ST segments of preceding beats. The 12-lead ECG that accompanies the lead II rhythm strip shown in Figure 1 is shown below (in Figure 3). How do you interpret this 12-lead ECG? Does this 12-lead tracing provide a reason for the 2nd degree AV block, Mobitz Type I conduction disturbance seen in Figure 1? Figure 3: 12-lead ECG from the 50-year-old woman with chest pain whose lead II rhythm strip was shown in Figure 1. (Reproduced from ECG-2014-ePub). ST elevation in each of the 3 inferior leads (leads II,III,aVF). Reciprocal ST depression in leads I and aVL. Positive “mirror test” ST depression in leads V1,V2. This suggests either: i) reciprocal ST depression; ii) posterior wall involvement; iii) concomitant ischemia in the LAD (left anterior descending) coronary artery distribution; or iv) some combination of i, ii, iii. ST elevation in lead III > lead II – and – marked reciprocal ST depression in lead aVL (more than in lead I) – both of which suggest a proximal RCA (Right Coronary Artery) occlusion. Given the usual vascular supply of the RCA (that most often supplies the AV node and the posterior wall of the left ventricle) – acute RCA occlusion may be commonly associated with both AV Wenckebach and posterior as well as inferior wall involvement. FINAL Clinical ECG Point: Note how ST segment and T wave morphology seems to vary from beat-to-beat. Much of this is simply the result of the regular atrial rhythm that “marches through” the Mobitz I AV conduction disturbance. Appreciation of the distorting effect of regular atrial activity explains the difficulty in definitive assessment of ST-T wave morphology. 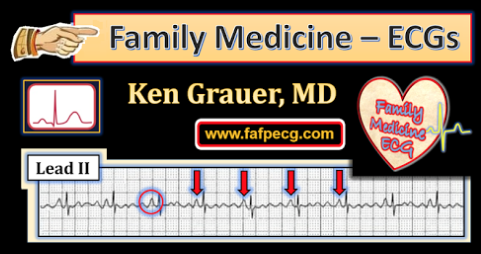 ACKNOWLEDGMENT: My appreciation goes to Ankur Jain, MD for allowing me to use this ECG and this clinical case. 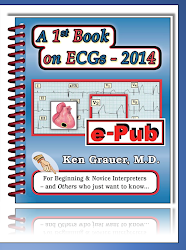 See also ECG Blogs #19, 20, 21 – and Section 20.0 in our ACLS-2013-ePub to download PDF Review on the AV Blocks. Review of Laddergrams begins in Section 20.25 in this pdf. 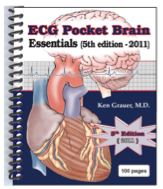 Link to Section 10.0 for pdf download on the ECG Diagnosis of Acute MI (from our ECG-2014-ePub). The ECG in Figure 1 was obtained from a 60-year old man currently undergoing chemo- and radiation therapy for lung cancer. He presented to the ED (emergency department) with weakness and palpitations, but no chest pain. 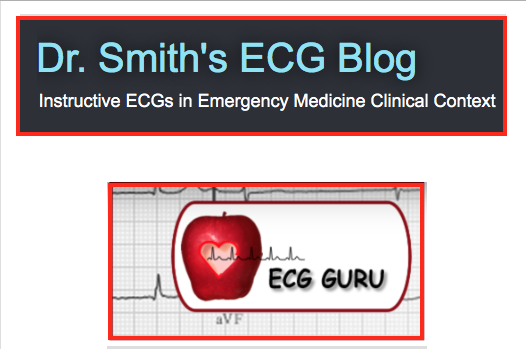 Should the cath lab be activated for acute STEMI? If so – what do you suspect the “culprit artery” is likely to be? Anything else likely to be going on given this clinical history? Figure 1: ECG from a 60-year-old man with lung cancer. Is this ECG diagnostic of an acute STEMI? 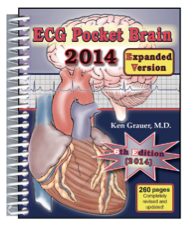 (Reproduced from ECG-2014-ePub). NOTE – Enlarge by clicking on Figures – Right-Click to open in a separate window. INTERPRETATION: The rhythm in Figure 1 is sinus tachycardia with one PVC (Premature Ventricular Contraction). The PR and QRS intervals are normal. The QT interval is difficult to assess given the tachycardia and lack of distinct end point of T wave inversion. The axis is normal at ~ +70 degrees. There is no chamber enlargement. There is coved ST elevation in each of the inferior leads (II,III,aVF) ― and in lateral precordial (V4,V5,V6). In each of these leads, there appears to be T wave inversion following descent of the ST segment. There is scooped (reciprocal) ST depression in leads aVL and V2. Lead V3 shows transition between the reciprocal ST depression in lead V2 ― and the ST coving and T wave inversion that begins in lead V4. There is no history of chest pain. The patient has lung cancer with ongoing chemo- and radiation therapy. The shape of the ST segment elevation is a bit “off” for acute STEMI …. Despite valid concern about possible acute infero-postero-lateral STEMI (either from a proximal right coronary vs dominant left circumflex occlusion) ― lack of defined “onset” of symptoms in the context of a patient with cancer should prompt additional data gathering prior to cath lab mobilization. Initial serum troponins were negative. The patient was taken to the cath lab. No acute lesion and no significant coronary disease was found. While in the cath lab ― additional lab values returned showing a markedly elevated serum calcium value = 17 mg/dL. Comparison ECGs were ultimately found. These were clearly abnormal. While a similar degree of ST elevation was not seen on prior tracings ― there was definite ST segment coving with T wave inversion present on one of the earlier tracings. CONCLUSION: All ST segment elevation is not necessarily the result of acute coronary occlusion. In addition to common other causes of ST elevation (ie, early repolarization variants; acute pericarditis) ― chronic ST elevation may result from either ventricular aneurysm or cardiomyopathy. This case serves to remind that Hypercalcemia is yet another potential STEMI-mimic. Textbooks describe QT interval shortening as the principal ECG manifestation of hypercalcemia. That said ― this is not an easy finding to detect because: i) Usually marked hypercalcemia (levels >12.0 mg/dL, if not much higher) are needed before the QT noticeably shortens; ii) it is often difficult clinically to distinguish between a QT interval that is within the “normal” range vs one that is shortened; and iii) ECG manifestations of hypercalcemia are superimposed on any baseline abnormalities that may be present. We mentioned above that the shape of ST segment elevation in this case was a bit “off” for acute STEMI. By that ― we mean that the coved ST segments seemingly peak a tad earlier than is usually seen. That said ― the overall QT interval in this case is not shortened, but if anything lengthened by preexisting T wave inversion that was seen to be present on prior comparison tracings. BOTTOM LINE: Without the benefit of prior comparison tracings and the serum calcium value at the time the decision to emergently perform cardiac catheterization was made ― there is NO WAY (in our opinion) that one could rule out the possibility of acute STEMI. Much more than just coved ST elevation with symmetric T wave inversion ― there is also what appears to be indisputable reciprocal ST depression in both leads aVL and lead V2. Even knowing that the serum calcium value = 17 mg/dL ― we still feel that without availability of prior tracings for comparison ― that there is no way to rule out the possibility of concomitant hypercalcemia superimposed on acute STEMI. TAKE-HOME POINT: All that elevates ST segments is not necessarily acute STEMI. History is ever important. On rare occasions ― hypercalcemia not only shortens the QT interval, but may also elevate ST segments. ECG manifestations associated with electrolyte disturbance (be this due to abnormal potassium, magnesium or calcium values) are superimposed on any baseline ECG abnormalities that may be present. ACKNOWLEDGMENT: My appreciation goes to Jiann Ruey Ong for allowing me to use this ECG and this clinical case. See Section 11.0 on Electrolyte Disturbances (in ECG-2014-ePub) ― with the part on Hypercalcemia beginning in Section 11.1. The ECG in Figure 1 was obtained from a patient who walked into the ED (Emergency Department) with new-onset chest pain. How many ECG signs support your impression? Figure 1: ECG from a patient with chest pain. What are the findings of concern? 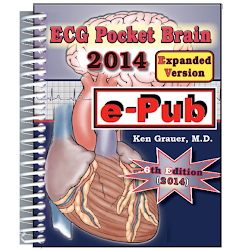 (Reproduced from ECG-2014-ePub). NOTE – Enlarge by clicking on Figures – Right-Click to open in a separate window. INTERPRETATION: The ECG in Figure 1 is shows normal sinus rhythm. All intervals and the axis are normal. There is no chamber enlargement. There are however, a series of alarming findings that were recognized by the emergency team. Emergency cardiac catheterization was performed within 15 minutes after the patient walked into the ED ― with successful reperfusion of a 100% proximal LAD (Left Anterior Descending) coronary artery occlusion. Hyperacute T waves in multiple leads. These are best seen in leads aVL, V2,V3,V4. DeWinter T wave complexes ― in which there is 1- to 3-mm of upsloping J-point ST depression in one or more precordial leads that continue into tall, positive symmetrical T waves (DeWinter – NEJM 359:2071, 2008). Although seen in Figure 1 to some extent in all precordial leads except for V1 ― the DeWinter T wave is best manifested in leads V3,V4. Loss of anterior R waves (with reduction in R wave amplitude between leads V1-to-V2). Marked inferior reciprocal ST depression. ST elevation in leads aVR and V1. Incomplete RBBB (rSr’ in lead V1; narrow terminal S waves in leads I and V6). Awareness of the relatively uncommon but highly characteristic DeWinter T wave sign is essential for not overlooking the approximate 2% of acute anterior infarction patients who present with this ECG manifestation (Ref 1). Rather than frank ST elevation that usually accompanies acute LAD occlusion ― there is instead the unique DeWinter complex with upsloping J-point ST depression blending into tall upright hyperacute T waves in a number of precordial leads (esp. leads V3,V4 in Figure 1). We emphasize the following key points about this syndrome. In patients presenting with new-onset chest pain ― there is extremely high specificity for the DeWinter T wave pattern and acute proximal LAD occlusion. Rather than evolution of tall, peaked (hyperacute) T waves into frank ST segment elevation ― the DeWinter T wave pattern was surprisingly static over the next few hours in the DeWinter series of patients. None of the patients in the DeWinter series who manifested this ST-T wave pattern had acute left main occlusion on catheterization. Despite prompt recognition and intervention ― a significant percentage of patients developed positive cardiac markers for acute infarction. One ECG sign that infarction may have already occurred is loss of anterior r wave amplitude (as is seen in Figure 1). TAKE-HOME POINT: Prompt recognition of the DeWinter T wave sign in patients with new-onset chest pain with immediate mobilization of the interventional cardiology team On-Call is essential for minimizing the extent of acute anterior infarction. As is the case for Wellens’ Syndrome (See Section 10.54 of the pdf in the References below) ― precordial DeWinter T waves is another unique ECG sign with high correlation to acute anatomic coronary occlusion with mandate for immediate intervention. Significant ST segment elevation in leads aVR and V1. Incomplete RBBB (that is presumably new). Marked reciprocal inferior ST depression. Hyperacute T wave in lead aVL. ACKNOWLEDGMENT: My appreciation goes to Andrew Bowman for allowing me to use this ECG and this clinical case. http://tinyurl.com/DeWinter-NEJM ― Link to my dropbox for download of the original NEJM manuscript by Dewinter. 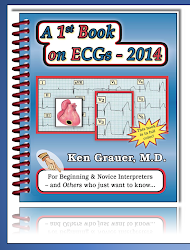 Link to Section 10.0 from our ECG-2014-ePub. Figure 13.3-1 in Blog #126 shows another example of DeWinter T waves.